Final regular-season home game for the Bulldogs, and it comes with an early start for FSN television. The Bulldogs weren't at their sharpest Friday in a 1-1 tie that ended with an Omaha shootout win. UNO won a lot of races and a lot of battles, and UMD will have to be better in all zones to get out of here with four points on the weekend. It will also have to break what's been a bit of a hex on Saturdays. Since Christmas break, UMD has had four chances to win an NCHC series on Saturday (North Dakota, Western Michigan, St. Cloud State, Miami) and is 0-4 in those games, outscored 17-8. Before the game, UMD will honor seniors Adam Krause, Justin Crandall, Derik Johnson, and Alex Fons. Krause, Crandall, and Johnson have combined to play 366 games in these colors, with 55 goals and 128 points. Obviously, they're hoping to play more in this building, but they get their salute Saturday just in case. Greetings from Amsoil Arena. Feels like I was here less than 24 hours ago. Weird. Anyway, the Bulldogs and UNO Mavericks face off in around two hours. Kasimir Kaskisuo vs Ryan Massa in net. Hectic few days at work with our changeover to 92.1 The Fan (WWAX-FM) coming Monday. That's the reason for no normal Friday pregame blog. No Alex Iafallo for UMD. The sophomore was practicing this week and is not in the lineup for the Friday tilt because of illness, I'm told. We'll see about Saturday. Get through this first. No Saturday blog because I'll be at the Proctor Arena working the Minnesota Hockey 12UA Olympic Region Tournament, which we're hosting this weekend. Saw some great hockey this afternoon, as top seed Brainerd rallied from two goals down to beat Thief River Falls 5-4 in double overtime. Fantastic game. If you're looking for a youth hockey fix this weekend, come up to Proctor. That said, follow me on Twitter for thoughts and lineup news if there is any during the day Saturday. And don't forget Saturday's game starts at 6pm Central time. Tickets say 7pm, but the game was moved up an hour to accommodate Fox Sports North television. On the surface, the result was the same. A two-goal win Friday and a tough loss Saturday. A 60-minute effort Friday, but only three points on the weekend. A split. In no other way was UMD's split against Miami similar to its split against St. Cloud State. The Bulldogs competed Saturday. They played hard. They battled. They executed wonderfully at times. It just wasn't quite enough. Miami rallied from 3-1 down with a goal set up by a great power play, followed by an actual power play goal, then won it in overtime on a Blake Coleman goal 4-3 over UMD. In all honesty, it was a wonderful game and a great series, every bit as enjoyable for me as the Denver weekend was. Miami solidified its status in the completely unofficial and 100 percent meaningless Ciskie Top Five (joined by UMD, Minnesota State, North Dakota, and Boston University in an order I refuse to try to determine). Yes, UMD proved it belongs. The Bulldogs went into a tough building against a great team and won four of the six periods. I was impressed by much of what I saw, starting with a pretty solid 120-minute effort. Was it perfect? No. UMD made some mistakes, especially on Saturday. But it's easier to refine execution than it is to coax effort at this point in the season. There were a few missed scoring chances, a couple instances where guys overpassed, lost faceoffs, and failed to clear the defensive zone. Miami made UMD pay for some of the mistakes and played a strong game on Saturday. The fact UMD led much of that game is a credit to its battle level and its freshman goalie. Yeah, Kasimir Kaskisuo allowed five goals on the weekend. They came on 80 shots. Considering the quality of the opponent and the quality of its chances, this might have been Kas' best weekend in our colors, even though we only won one game. Practically stood on his head in the second period Saturday (24 saves). 45 stops in the game. And how about that UMD power play? Two more goals Saturday and four on the weekend in eight chances. Nothing fancy. Guys shot the puck and went to the net. Then they stayed at the net and caused trouble for the Miami goalie of choice. Sometimes, you don't need to draw up a cross-seam, high-low or low-high play. Just get the puck to the net. Worked for UMD on the weekend, and this would be a really good time for the power play to get hot. In the end, Anthony Louis and Coleman made a play, and Miami got the money. Louis was great all night, using his speed and skill to create space and opportunities. Austin Czarnik continues to only have two goals this season, but man is he a good player. UMD could see Miami again after a 2-2 season series split, either in the NCHC playoffs or the NCAA Tournament. Despite the strong effort, UMD fell to fifth in the NCHC, and would be on the road for the first round of the playoffs if the season ended today. Oh, and UMD's third in the Pairwise. So it's possible a No. 1 NCAA seed doesn't even get home ice in its conference playoffs. OXFORD, Ohio -- It was very Minnesota-y here, with close to a half foot of snow falling on a mild day, the warmest of the trip so far. Oddly, there was apparently at least discussion about the status of this game, as Miami's hockey Twitter feed sent multiple updates saying the game would be played as scheduled. Hey, this isn't Minnesota. I saw a guy using a snowblower to take down what couldn't have been more than a couple inches left outside his business. In Minnesota, one gets chided for something like that. Anyway, tremendous and significant opportunity for UMD in this game, with a chance to sweep the series and at least maintain a home-ice spot. Denver is hosting Colorado College, so it seems a safe bet the Pioneers get points and at least keep pressure on UMD, if not pass the Bulldogs if they don't win. No Dominic Toninato for the Bulldogs. No Riley Barber for Miami. OXFORD, Ohio -- Stop me if you've heard this one before. UMD outscored and badly outshot an opponent in the third period to break open a tie game and win. Well, it happened again Friday at Steve Cady Arena. UMD scored two third period goals to break a 1-1 tie and outshot Miami 16-8 in the third en route to a 3-1 win. On the year, UMD has outscored opponents 43-25 in the third period, and a plus-97 shot differential is its highest of any period (plus-91 in the first, plus-36 in the second). Freshman goalie Kasimir Kaskisuo made 30 saves, including 22 over the first two periods. He was peppered at times as the Bulldogs gave up some extended zone time here and there, but they also blocked 14 shots and cleared some loose pucks from the danger zone. Third periods have become a bit of a way of life for UMD up to this point, but this game saw UMD set itself up for third period success by killing off a pair of Miami power plays in the second and doing a better job defensively. Then Tony Cameranesi took over. He had a great scoring chance down the right wing early in the third, then on a power play, he found a puck Miami goalie Jay Williams couldn't cover up and jammed it home for a 2-1 lead. UMD had to kill off two more Miami power plays in the first half of the third. The back-to-back chances included a brief five on three for the RedHawks. MU got three shots on the first chance, but none on the second as UMD did a great job keeping the home team to the outside. A great effort by Cal Decowski in the left corner led to a huge second third-period tally. Decowski got the puck to Willie Corrin, who walked into the left circle and ripped a shot by Williams to make it 3-1. Miami never really threatened after that, and UMD picked up its 19th win of the season. Miami entered the game third nationally in faceoff percentage. UMD is in the bottom ten. But UMD, continuing its recent trend upward, won 29 of 56 draws against Miami, and made the RedHawks centers and forwards work for a good number of the 27 they won. UMD has won five of six, and a big reason for it is the improved play in the faceoff circle. Look at the fact that the Bulldogs have dealt with some good faceoff teams in this run of games, yet have won more than they've lost. It's a huge turn of events that is largely overlooked out there. Another big factor Friday was UMD's battle level, which I thought was outstanding, especially in the third period. Decowski beat out two MU players for the puck that set up Corrin's goal, and UMD was clearing pucks defensively while driving the net offensively. It was a tremendous effort that led to a tremendous win. Adam Krause and Andy Welinski had big-time effort plays during penalty kills. Oh, and did I mention the 14 blocked shots? UMD also was solid defensively, keeping Miami's transition game at bay outside of Blake Coleman's first period goal, which came 50 seconds after Justin Crandall gave UMD the lead with a power-play goal. Finally, how about that special teams effort? UMD scored twice on four chances against the best penalty kill (percentage-wise) in the NCHC, while holding a potent power play off the board in four chances of its own. In referencing last weekend, UMD coach Scott Sandelin said before the game that "when you win the special teams battle, you expect to win hockey games." His team did just that on Friday. Now, it's time to win on Saturday. UMD has split three of four NCHC series since break, and the Bulldogs are 1-3 on Saturdays in those four series. That just doesn't get the job done. To win this league, we need to see some sweeps. Even with a tremendous opponent this weekend, the Bulldogs have a chance to finish off a six-point get, and it would be great to see them pull it off. Elsewhere in the NCHC, St. Cloud State blew a 2-0 lead before rallying late to beat Omaha 4-3. Ethan Prow scored two power-play goals in the first period, then UNO rallied, taking the lead on Austin Ortega's power-play goal in the third. But SCSU answered, getting goals 16 seconds apart from Blake Winiecki and David Morley for the win. With the victory, SCSU is back to .500 overall and has shot up to 14th in the Pairwise, putting the NCHC in position to potentially get six of its eight teams in the NCAA Tournament. In Kalamazoo, North Dakota held off Western Michigan 3-1. UND took sole possession of the NCHC lead with the win, as both Miami and UNO lost. Nick Schmaltz set up two goals and Zane McIntyre made 33 saves. Danton Heinen and Daniel Doremus each scored twice for Denver on Friday as the Pioneers won 6-4 at Colorado College to clinch the Gold Pan. Zac Larraza had a goal and two apples, and Denver kept pace with UMD in the race for the final home-ice spot in the NCHC playoffs. In those stadings, North Dakota now owns the top spot by three points over Miami and Omaha. UMD is one point behind the RedHawks and Mavericks and four back of UND. Denver remains two back of UMD, and St. Cloud State trails DU by four. With Friday's loss, Colorado College has clinched last place and will play the league champion in the first round of the playoffs. OXFORD, Ohio -- I know it's a pain from a logistical standpoint, but this is one of those weekends where the NCHC's television partner -- the wonderful folks at CBS Sports Network -- could really benefit from flex scheduling. No disrespect to Western Michigan or Colorado College, but which game do you think they'd be better off airing tonight? No TV for this one, so you're stuck with me. Apologies in advance. Remember, I don't make the television schedule. Exciting news, at least in my humble opinion. Lots of work in the interim, but it'll be awesome once we get rolling. 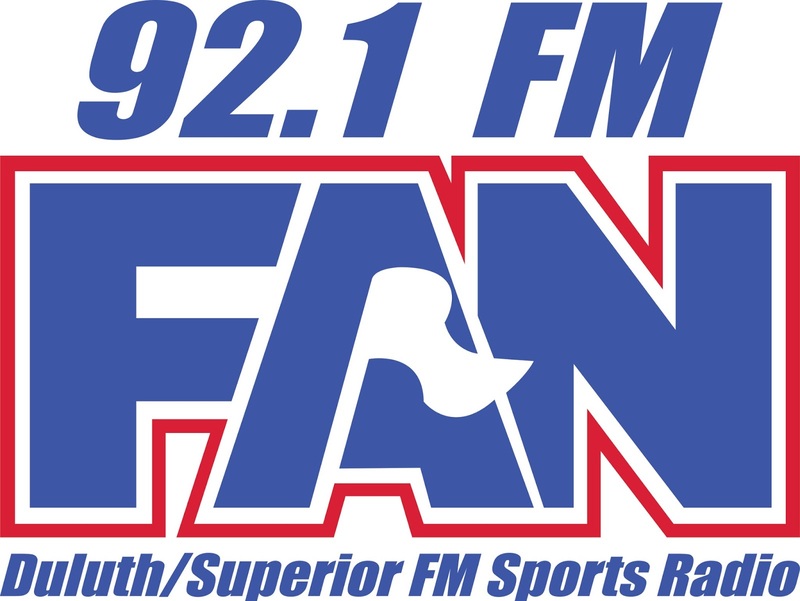 92.1 The Fan will continue to carry programming from KFXN-FM 100.3 in Minneapolis, highlighted by the Powertrip Morning Show (5:30am-9am weekdays), Paul Allen (9am-noon), “The Common Man” Dan Cole (noon-3pm), and Dan Barreiro (3pm-6:30pm). The Fan will also lead the way in local sports coverage. Starting with the March 6-7 series at Western Michigan, 92.1 The Fan will be Duluth’s radio home of UMD Bulldog men’s hockey. UMD football will move from KQDS-AM 1490 to 92.1 The Fan starting this fall. 92.1 The Fan will also carry a selection of high school sports, including football and hockey, along with Minnesota Wild hockey. OXFORD, Ohio -- The longtime college head coaches who face off this weekend are in agreement, not that it's difficult to form a consensus who believe the NCHC is a competitive conference. When talking about how hard these last four weekends of NCHC play are for everyone, Miami coach Enrico Blasi made it clear he wasn't complaining. "This is what we signed up for." When talking about how hard this conference in general is, UMD coach Scott Sandelin made it clear he wasn't complaining, either. "We all knew that when we signed up for it." In its second season, the National Collegiate Hockey Conference has already established itself as the toughest league in college hockey. Four of the top six in the current Pairwise -- along with five of the top nine -- reside in the NCHC. Two weeks from Saturday, we'll know the pairings for the NCHC quarterfinal series. I can tell you right now that every coach of a home team will talk about how his team is playing a team no one wanted to have to face in a best-of-three. Even lowly Colorado College is showing signs of life thanks to improved defensive play. If the Tigers figure out how to score, they're going to give real trouble to the league regular-season champ. What we have in Oxford this weekend is a marquee matchup of teams that are -- at least in my estimation -- among the five best teams in Division I. They played an outstanding series in Duluth on Halloween weekend, and I expect this one to be similarly good. "I feel they're one of the best teams, if not the best team, in our league," Sandelin said of this week's adversary. "Oh, my God, it's become quite a rivalry, and we know how hard they play and how skilled they are, and how well-coached they are," Blasi said. "It's going to be a fun weekend, two good teams going at it." Look at this Miami roster. The RedHawks are so deep and talented up front that it doesn't even matter that senior captain and Lowe's Senior CLASS Award finalist Austin Czarnik somehow only has two goals this season. Miami will field a lineup that features four guys in double figures in goals. Sean Kuraly (14), Riley Barber (13), Cody Murphy (11), and Blake Coleman (10) all can fill the net. They're highly-skilled players who make life a living hell for opposing defenses. While the RedHawks don't sport the high-end skill Denver has on its blue line, the RedHawks are just as active. Matthew Caito, Ben Paulides, and stud freshman Louie Belpedio (Sandelin says Belpedio is "as good a freshman 'D' as I've seen in a while") aren't afraid to get down around the faceoff dots. They don't score a lot (Miami's blue line has combined for 12 goals this season, while UMD has 16), but they force teams to account for them in close. That can create chances for the forwards as the puck goes low to high and people get open. UMD counters with even more offensive balance. Miami has the four guys in double figures, but only six total players with five or more goals. Even taking leading scorer Dominic Toninato out of the equation (he's on the trip but not a safe bet to be in the lineup), the Bulldogs have eight players with five or more goals. The Bulldogs' team speed has given even top defensive teams like Denver fits this season, and I expect there will be times this weekend where UMD is able to establish its forecheck and just suffocate Miami. But the RedHawks are so skilled up front that they don't need much of an opening to make something happen. Saturday wasn't a great performance for UMD. The Bulldogs fell to St. Cloud State 4-1 and looked just flat, especially in the second period. Sandelin says he's heard coaches talking about how their players put so much into a Friday win that they had nothing left on Saturday, but he won't go there. "I don't know how you can't play 120 minutes of hockey," Sandelin said this week. "It's what you signed up for." Even if UMD had lost on Friday, Sandelin would have been pleased with his team's performance. The same wouldn't necessarily been true had they found a way to win Saturday's game. "Everyone focuses on the end result, I look at the 60 minutes," he said. "For us to come out and not have a better game on Saturday, for me and the guys, it's not acceptable. There's no excuse for it. Not when you're 30 games into the year and playing for valuable points. We had a good talk about that Monday." Sandelin was quick to say he doesn't expect his team to play perfectly at this stage. However, he wants a better effort for 120 minutes or more this weekend. "It can't just be one night. It can't just be part of the game. We need it from everybody. We need to play better hockey for 60 minutes. We've got to play better. Our league is too good. Any lapses cost you." Quick injury update for you. As I mentioned, Toninato is on the trip. However, listening back to Sandelin's press conference Wednesday, I'd say it's unlikely he plays Friday. UMD brought eight defensemen on the trip, and one of them -- probably freshman Nick McCormack -- will likely play on the fourth forward line Friday. That's a sign that Toninato won't play. Freshman Blake Young, who had been playing on said fourth line, went down in the first period Saturday and did not return. He did not make the trip. I don't know if there's any chance Toninato plays this weekend, or if it's like when Adam Krause went on the Omaha trip when I had a better chance of playing than he did. All I know is he practiced some on Wednesday and he's here this weekend. Hopefully, even if he doesn't play, it's a sign of progress in his recovery. Back in Duluth, the UMD women's hockey team will host a very special night on Friday. The series that opens against Ohio State is critical for the Bulldogs' chances at home ice in the WCHA playoffs next weekend, but that's not the most important thing happening at the rink. Julianne "Montana" Vasichek was a two-time All-American as a player at UMD (the nickname works because she is from Great Falls, Mont.). Now the hockey equipment manager and strength and conditioning coach for the women's team, Vasichek is battling a serious illness. The Bulldog program is trying to help. Vasichek was diagnosed with ulcerative colitis back in 2002, while she was still playing for UMD. If that wasn't bad enough, she was hit with a diagnosis of primary sclerosing cholangitis (PSC) five years later. PSC is a very rare disease that affects the liver. Vasichek has undergone multiple procedures to open her bile ducts and place stents (they're called ECRPs, she says she's had around 12-15 of them total). Thankfully, she isn't on the list for a liver transplant because her score is too low. We hope it stays that way. According to statistics available for December through LifeSources, there were 546 people awaiting liver transplants in the local region (Minnesota, North Dakota, South Dakota) and 15,465 awaiting liver transplants nationally. Contrast those statistics with only 118 liver transplants performed regionally in 2013, and the numbers show that about 21 people died waiting for a transplant every day. Vasichek also points out that every 10 minutes, a person is added to the national transplant list, proving how great the need is for awareness of organ donation. That leads us to this weekend. Vasichek's passion is multi-fold at this point. She wants to raise awareness of PSC and help raise money for research. Vasichek also wants to help get more people registered to be organ and tissue donors. "I am not really the type of person to sit around and wait for something to happen, I like to make things happen and be involved in the process," she said. "While playing hockey at UMD, I had the opportunity to learn leadership and problem solving skills from great leaders, coaches and teammates that I played with. When I was first diagnosed with PSC and after a short period of adjustment to a life with a new chronic disease, I felt like I wanted to contribute to a solution for myself and hopefully many others." On Friday, the Bulldogs are asking fans to help by donating to any of a number of great organizations. Also, Vasichek is doing a fundraiser for PSC Partners that you can contribute to here. Even hit by a splitting headache, Vasichek was in a good mood at the rink Wednesday. She's always in a good mood at the rink. This is a great cause, and we're all pulling for "Montana" as she continues her battle. Let's not mince words here: For UMD to win the NCHC or make noise in the NCAA Tournament, games like Saturday better not happen much, if at all, the rest of the way. After a pretty good start to Saturday's game -- albeit with no goals -- the Bulldogs fizzled badly and fell 4-1 at home to St. Cloud State. The first five minutes were pretty good for the Bulldogs. UMD cycled the puck, had strong possession, and kept St. Cloud State from getting anything going offensively. Then came the first media timeout, and the Bulldogs weren't the same afterward. The Huskies began to push back, taking the lead in shots on goal for good in a sequence that saw them get six in a row on Kasimir Kaskisuo. The game stayed scoreless because Kaskisuo was sharp and SCSU didn't do a great job of getting to the net. The second period saw more of the same. SCSU outshot UMD 14-7, had a number of good scoring chances, and was clearly the better team. The Bulldogs lacked jump, didn't really get much going with the puck, and looked like the slower of the two teams after seemingly wearing down the Huskies the night before. Two David Morley goals put the adversary ahead 2-0 in the third period, but Austin Farley scored on a rebound to make it 2-1 with UMD's second power-play goal of the weekend. It is the first time UMD scored power-play goals in both ends of a weekend series since Nov. 14-15 against Minnesota. That positivity didn't last long. UMD had a golden chance to tie it up, but Tony Cameranesi hit the goalpost on a partial breakaway after using a backhand move to beat goalie Charlie Lindgren. Shortly after that, defenseman Carson Soucy took a penalty for playing with a broken stick, and Patrick Russell scored on the power play to give SCSU a 3-1 lead. Joey Benik hit an empty net late for the final margin. Not much more to say. UMD wasn't sharp enough, quick enough, or hard enough to play against on Saturday. I don't know if there were guys who thought it would be easy after they dominated puck possession Friday. But just can't happen. Senior Justin Crandall made a good point after the game, telling reporters it reminded him of the North Dakota series, where UMD closed on a win late Friday before laying an egg Saturday. The three points lost here might not kill them in the NCHC race, and UMD's NCAA hopes are still in great shape. Big picture, it's not the kind of thing that can be repeated again. Couple quick notes to close. Don't know what the status of Dominic Toninato is. Heard from a few people who saw him walking around on Saturday. I'd guess he'll do everything he can to get on the ice for practice this week, and if there's any chance of him playing, he'll make the trip to Oxford. If there isn't a chance that he plays, UMD should take eight defensemen, and I believe Scott Sandelin will do that. This isn't the Omaha trip, where Adam Krause traveled even though he had no chance of playing. As of now, UMD has eight defensemen who are cleared to play. Might as well use them. Now, the status of Blake Young might change that. Young left in the first period Saturday and didn't return. If he can't travel to Oxford, we'll see what Sandelin does for extras on the trip. I thought Kaskisuo made some huge saves Saturday, especially in the second period. But the first goal Friday and first and third goals Saturday didn't look that great. Overall, a solid performance that kept UMD alive for most of the game. But there's improvement needed in goal, too. UMD is four points out of the top spot in the NCHC, which is now a three-way tie between Miami (UMD's next opponent), Omaha, and North Dakota. Totally within striking distance, but the Bulldogs could still end up on the road for the first round of the league tournament. That's how tight it is right now. Work to get done in a short week at the office. That'll do it for me. UMD fell to seventh in the meaningless USCHO poll, but is fourth in the PairWise, which will matter March 22, when selections are due out. Barring big news, we'll talk Thursday from Oxford and in between on Twitter @bruceciskie. Pressure isn't the right word. Maybe I'll go with "opportunity." UMD has already clinched the regular-season series against St. Cloud State after Friday's 4-2 win. Now, opportunity knocks on a couple fronts. A win in the series finale sweeps the season series from a longtime nemesis -- also returning the favor after SCSU pulled off a clean four-game sweep of UMD last season. It leaves UMD very much in the conversation for the NCHC regular season championship with six games remaining. Home sweeps are fun. I'm a fan of stick salutes. Let's get another one and make it five straight wins. Entering Friday's game at Amsoil Arena, UMD had outscored opponents 36-21 in third periods this season. UMD put up a four-spot in the third period to turn a 1-0 deficit into a 4-2 home win over St. Cloud State. The Bulldogs fell behind late in the first period after Blake Winiecki beat Kasimir Kaskisuo from a distance in the final minute. The goal was a bit deflating for the crowd, as UMD had just killed off a Huskies power play. The Huskies held that lead all the way into the third, but UMD was controlling possession, for the most part. SCSU had a couple flurries, but generally could not get anything going in the offensive zone. The Bulldogs held a potent Huskies attack under 40 shot attempts in the game, largely because of dominant puck possession that was keyed by a great performance in the faceoff circle. For a team that was struggling on faceoffs, UMD sure has surged the last couple of games. The Bulldogs won 41 of 68 draws last Saturday against Northern Michigan before taking 37 of 61 on Friday night. The catalyst? Freshman Jared Thomas, who was on the fourth line before being elevated last Saturday to take the spot of injured top-line center Dominic Toninato. Thomas scored the tying goal three minutes into the third on a great move toward the middle after he ran down a puck on the left wing in the offensive zone. Derik Johnson's first of the year and just his second career goal gave UMD the lead more than three minutes later. Justin Crandall and Adam Krause added goals later, Crandall's coming after a great defensive play by Alex Iafallo prevented a short-handed chance for SCSU. Yeah, coach Scott Sandelin and his staff believed in Thomas, a former Hermantown star. As assistant coach Jason Herter said Wednesday, "We recruited him for a reason." However, Sandelin was quick to point out last week that it the move was also about the lack of center depth and Sandelin's desire to keep lines centered by Tony Cameranesi and Cal Decowski together intact. They'd both been playing well -- especially Cameranesi, Austin Farley, and Karson Kuhlman -- and he didn't want to disrupt that. Thomas has been a hell of a find for that top line. Buoyed by his 27-10 performance on faceoffs over the last two games, he and linemates Iafallo and Krause have spent more time with the puck and less time chasing it. Cameranesi -- who has quietly been vastly improved in the faceoff circle -- continues to hold up his end of the bargain, and what was a weakness for 25 games is becoming a strength. The win puts UMD at 18 wins, two shy of a 20-win season that would be the fifth in seven years for the Bulldogs. If that ends up happening, it'll be the first time in program history that UMD has posted five 20-win seasons in seven years. UMD needs to be better. While the Bulldogs held Jonny Brodzinski in check (three shots, minus-two, 6-15 on faceoffs), Joey Benik had a goal and eight shots. The Bulldogs were guilty of some sloppy play in their zone again, though I would argue they did a very good job in the neutral zone, and that largely covered for any mistakes in their end. But St. Cloud State is going to come at them on Saturday. I can't imagine Bob Motzko was pleased with his team losing faceoffs, turning pucks over like crazy, and only taking 36 shots on the night. With goalie Charlie Lindgren pulled late, SCSU didn't get a shot on goal, eventually conceding captain Adam Krause's empty net goal. In the third period, UMD took 26 shots to seven. Motzko won't be happy about that, but his team had already shown a propensity for irresponsibility, especially in the neutral zone. That's a huge change I expect to see on Saturday. SCSU won't be that sloppy again. UMD will have to be sharper with its own puck management and will need to continue to do a good job defending the transition game. Discipline will help. UMD took just two penalties for four minutes and shut down a 23-percent power play that was eight for its last 23. UMD scored a huge power-play goal off the rush in the third, as Iafallo broke up a scoring chance in his own end, led the charge, and fed a puck across the slot to Crandall. The four-week race to the Penrose Cup started Friday, and with one exception, the league's top four teams held serve. That notable exception was Omaha, as the first-place Mavericks fell at home to Western Michigan 2-1. The Broncos went Meat Loaf on the power play, getting man-advantage goals from Colton Hargrove and Taylor Fleming, and that was enough for Frank "The Big" Slubowski. The veteran WMU goalie kept UNO off the board until Jake Guentzel got one in the final two minutes. In Grand Forks, North Dakota beat a heavy-hearted Denver team 4-2. DU is playing without its head coach this weekend, as Jim Montgomery left the team after the death of his father. We send him and his family our sympathies. Quentin Shore tied the game 2-2 for DU in the third, but Nick Schmaltz answered to give UND the lead, and Michael Parks scored his second of the game on the power play with 4:43 left. Zane McIntyre made 18 saves as North Dakota picked up its 20th win for the 11th time in 11 seasons under Dave Hakstol. Yet message board idiots get all fired up every time they lose. Man, some people need hobbies. Miami got a short-handed goal from Riley Barber in the second period to take the lead for good in an eventual 3-1 win at Colorado College. The RedHawks also got goals from Cody Murphy and Justin Greenberg in support of goalie Jay Williams, who made 22 saves. UND takes the league lead by two points over Omaha and Miami, who are tied for second. UMD is three points back in fourth, while Denver now trails by seven points. I know it looks like there is some more separation, but that can change in one short night. First off, a PSA of sorts: If you're coming to either game, you should plan on arriving early. We're expecting good crowds both nights. St. Cloud State comes in off a bye, which always adds a bit of a variable to things. "Rested legs" can sometimes look like "tired legs" in that they share a similar characteristic: They aren't going. Some teams bounce off a bye and play great. Or you can look like UMD did in the first period and change against Colorado College Dec. 5. For UMD, hopefully it's another strong effort. Outside of the second period of Saturday's 6-3 win over Northern Michigan, the Bulldogs played pretty well. Not a perfect performance, but plenty of positives to build off of as the stretch run begins. No time for slow starts or poor efforts now. UMD -- and the rest of the NCHC -- are in what will be a furious race to the regular-season finish line. And then it all starts again. In November, UMD tussled with St. Cloud State at the Herb Brooks National Hockey Center. The Bulldogs swept the series with 3-2 (overtime) and 3-1 wins that accentuated the way the first half of the season went for the Huskies. "We're a completely different team now," SCSU coach Bob Motzko said. "Our offense was darn neaer anemic the first half of the year." Uncharacteristically, St. Cloud State scored one or two goals in half (eight) of its 16 games over the first half of the season. SCSU went 0-7-1 in those games, and 6-2 when scoring three or more goals. In the second half of the season, the pattern has continued. St. Cloud State is 0-4 when scoring one or two goals, and 6-0 when scoring three or more goals. Over the last four games, the Huskies have ripped off 22 goals. In there is a 7-0 win over Western Michigan and a sweep of Colorado College where the Huskies outscored CC 13-1. The power play is eight for 23 in those four games. Small sample size, yes, but Motzko hopes the run has given his team some confidence. "The biggest thing is we like our team. I think that's the best compliment I have for our guys. Even though our record is not where it's been the last couple years, we like our team." A big part of the recent surge has been the play of scoring forward Jonny Brodzinski. Motzko moved Brodzinski to center after the UMD series in November, and it seems to have sparked both Brodzinski and the offense as a whole. The junior is up to 17 goals this season, including ten on what's become a lethal power play. That top power play unit -- Brodzinski, Joey Benik, freshman Patrick Russell, Kalle Kossila, and Andrew Prochno -- is as good as it gets. You can't just defend Brodzinski, which makes him so much more dangerous. It reminds me of Nic Dowd with SCSU last year, and Ben Hanowski before that. Even in a year like this, where the Huskies aren't blessed with great scoring depth, they have enough superb goal scorers that a guy like Brodzinski can get loose, even when other teams have to know St. Cloud is trying its damndest to set him up for a shot. Dowd was the same way. The Huskies had so much talent on that top power play unit that it was -- shockingly -- easy to forget that Dowd was out there. Next thing you know, the goalie's picking the puck out of the back of the net. Want to focus on Brodzinski? Fine. Benik has nine goals and 24 points, Russell has eight goals (five on the power play) and 20 points, Kossila has 32 goals in his SCSU career and is at 20 points on the season, and after a slow start, Prochno is rounding into form as one of the better two-way defensemen in the NCHC. Today's lesson? Stay out of the box. "We have to be disciplined," junior defenseman Willie Corrin said this week. "When we stay out of the box, our four lines go." Those four lines might end up looking a lot like they did Saturday, when fourth-line center Jared Thomas moved up to the top line and replaced sophomore Dominic Toninato, who was out with an injury suffered Friday night. The challenge these next four weeks becomes greater with Toninato being dinged up. I know Dom has irked a few UMD fans with some undisciplined play this year, and his faceoff acumen absolutely needs to improve (Thomas won ten of 13 draws Saturday against NMU). But Toninato is UMD's biggest and most consistently physical center, and he's not this team's leading goal-scorer by accident. Against teams like Miami and Western Michigan, both of which UMD has to deal with on the road where the opposing coach can choose line matchups, Toninato will be extremely valuable to the Bulldogs' cause. It's that way every weekend, but it's vitally important that UMD get him healthy now so he can play later. If that means he has to miss these games, the onus is probably on Thomas -- at least initially -- to deal with Brodzinski's line. The best part about Saturday wasn't necessarily how Thomas played. It was how his "promotion" to the top line didn't adversely affect anyone else. As we mentioned before, if you look at UMD's line chart for Saturday night, at least one player on each line and in each defensive pairing picked up a point. Charlie Sampair scored his first goal of the season, Tony Cameranesi's line combined on a goal, Justin Crandall scored short-handed, Adam Krause had a huge night, Nick McCormack picked up a point, and the offensive balance was fantastic. Corrin believes UMD has a stronger team five-on-five. St. Cloud State doesn't take a lot of penalties, so UMD has to be equally or more disciplined. We can't afford to put SCSU on the man advantage a bunch this weekend. If UMD is going to go on the power play and succeed, it's likely the Bulldogs will have to beat an aggressive penalty kill. SCSU isn't going to sit back like it sometimes does on the big sheet. Watching back one of the Denver games, the Huskies did a great job pressuring the Pioneers and taking away their clean zone entries. I know DU swept that series, but SCSU did a lot of good things defensively. The Huskies struggled to generate great scoring chances, but a lot of teams struggle to do that against DU. I expect these games to be played with pace, and while I believe UMD has a stronger team five-on-five, the Bulldogs have to beat improving goalie Charlie Lindgren and probably have to make things happen at even strength, given the struggles on the power play and the fact St. Cloud just doesn't take many penalties (UMD is 12th in Division I in penalty minutes taken, while SCSU is 53rd). It's the first of what should be four really good, intense weekend series to finish the regular season for UMD. If the Bulldogs don't stumble badly, they'll have an NCAA bid sewn up before the league tournament begins March 13. For UMD, a slight downtick in defensive play and a struggling penalty kill have heightened the need for more offense. With the power play generally not contributing, that means the Bulldogs are pressed to score more goals in other situations. UMD picked up five even-strength goals and a short-handed marker in a 6-3 win over Northern Michigan Saturday night in Duluth. The power play struck out on Saturday, and the penalty kill had a Meat Loaf night (two out of three wasn't bad, as after a sloppy coverage on the first goal, the killers did good work and scored a shorty in the process). When the Bulldogs produce at even-strength like they did Saturday, when they outshot NMU 32-12 during the portion of the game where both teams had an equal number of players on the ice, this team is going to be hellaciously tough to beat. UMD yearned a quicker start on Saturday after Northern Michigan got on the board early Friday and the Bulldogs looked like they were skating in mud for a good chunk of the opening stanza. Alex Iafallo got the Bulldogs on the board not four minutes in on Saturday, and Charlie Sampair followed just short of the seven-minute mark with his first goal of the season. It was a deserved result for Sampair, who played better this weekend than he had all year to this point, and certainly earned the two points and increased ice time he got. When NMU cut that two-goal lead in half, the Captain answered. Adam Krause ripped a wrist shot top shelf late in the first to make it a 3-1 lead. When NMU cut that two-goal lead in half, the Bulldogs' most consistent line -- Tony Cameranesi, Austin Farley, and Karson Kuhlman -- responded, with the former two setting up Kuhlman's wraparound goal that made it 4-2. When NMU got a power play late in the second period, senior captain Krause and assistant captain Justin Crandall conspired on a short-handed tally that put the game out of reach. The Bulldogs ended up with a half-dozen goals on the night, nine on the weekend, and they outshot the visitors 85-35 in the 120 minutes. Hell, someone might want to order more pink sticks. UMD got a bit leaky in the second period, and Northern Michigan's Jake Baker made a great read to recognize that Kuhlman -- who didn't have a stick -- wasn't paying attention to him as he crashed into the slot and scored off a perfect Reed Seckel centering pass. Baker was Kuhlman's guy on the play, but he was watching the puck in the right corner and didn't see Baker making his way toward the front of the net. The Bulldogs do have to find a way to cut down on the defensive lapses. They seem to most commonly happen after long stretches of offensive-zone possession. It's like the guys forget they have to defend their end of the ice when it isn't attacked for a while. It's human nature. You see a long period of puck possession, and you want to jump in the play. Everyone wants to jump in the play. A little overaggression, and suddenly it's a two-on-one the other way. You can't assume puck battles or races will be won. Players have to work hard to win them. UMD just can't afford to have all these defensive mistakes, especially when it should be working with momentum on its side. Dominic Toninato (or Tom Doninato, right, DU broadcasters?) sat out Saturday's game with an undisclosed upper-body injury. From the sounds of it, UMD doesn't expect it to be a long-term problem for Toninato. But all was well, because freshman Jared Thomas stepped up big-time. The former Hermantown Hawk won ten of 13 faceoffs, scored a third-period goal and added an assist. Thomas' three-point weekend (he also scored the game-winning goal Friday) was his first multi-point binge on a weekend since his two-goal game in Mankato back on Oct. 18. He stepped in for UMD's No. 1 center and played a strong game. They say freshmen aren't freshmen anymore once we get into the second half of the season. In Thomas' case, he showed a lot of maturity and poise in his game with Saturday's performance. With Scott Sandelin possessing no desire to break up Cameranesi's line or Cal Decowski's line, Thomas likely goes back to the fourth line against St. Cloud this weekend. However, everyone knows that there's a button that can be pushed if Toninato has a rough game while Thomas continues to produce in his more limited role. That is a good thing as we head down the stretch. Strength down the middle is a nice problem to have as February hits and March approaches. Already blogged about the crazy finish that's coming for the NCHC. Case in point: Miami's out to a 4-0 lead on Western Michigan with 12 minutes in their game at the Hockey City Classic Saturday in Chicago. Game's over, right? Western storms back with goals 37 seconds apart to cut the lead in half, then gets one with an extra attacker on in the final minute. The RedHawks did a good job in the final seven minutes of keeping pucks from getting to the net, however, and Miami survived 4-3 to jump ahead of UMD and Denver and take third place in the NCHC. No lead is safe. No game is over. Speaking of St. Cloud State, here come the Huskies. Since being swept at Denver, SCSU has won three of four and scored 272* goals. In all seriousness, take the seven out of that number, and 22 goals in four games is pretty solid. Juniors Jonny Brodzinski (17 goals) and Joey Benik (24 points) are leading the way offensively. But Bob Motzko has skill on all four lines. Oh, and Charlie Lindgren carries a .922 save percentage in NCHC play. I don't care that UMD swept at St. Cloud in November. This is going to be another in a long line of great series where a split appears ever-so-likely. The final non-conference game of the season for both teams, and despite 92 shot attempts, a 46-17 edge in shots on goal, and a win on Friday, there are things for UMD to work on. Scott Sandelin didn't like his team's start Friday, and you can bet they'll be reminded of that prior to this one. They have to get going much quicker, because you can bet Northern Michigan will play hard and show plenty of pride in this one. UMD wore down the Wildcats on Friday, and there's no reason that can't happen again. However, the Bulldogs have to come out with the feet moving in order to remove any doubt in the third period. With any luck, that happens. I like sweeps and stick salutes. Time to see one of each, please. For UMD, depth has been a strength. Friday night at Amsoil Arena, the Bulldogs showed that depth once again. The fourth line of Jared Thomas, Charlie Sampair, and Austyn Young was crucial throughout the night. Fittingly, it was Thomas scoring at Amsoil Arena for the first time as a Bulldog as UMD got two in the third to beat Northern Michigan 3-1. UMD started slowly, which was about the only thing it did wrong in this game. Northern Michigan's DJ Vandercook -- which I'm 76.43 percent sure is a made-up name -- scored at 2:52 of the first off a UMD turnover. Vandercook was a late addition to the lineup when Mitch Jones was scratched (we don't know if he was healthy or if he got hurt or sick) after the warmup. The Bulldogs just weren't quick out of the gate. They struggled with the puck, made some bad decisions, and really didn't have their feet moving. The Thomas line got things going with a quality shift. UMD built some positive momentum off a power play that came up empty. Eventually, a low-shot first period turned into UMD taking 36 total shots in the first and getting 12 on goal (NMU blocked 13 shots in the first alone). UMD got on the board short of the midway point of the second, towards the end of a Wildcat power play. Junior defenseman Willie Corrin stole a puck in the defensive zone and led the short-handed charge. Instead of just dumping it in, Corrin fired a laser from just short of the blue line that beat NMU goalie Michael Doan clean from about a foot or 18 inches off the ice. I've seen pucks take goofy bounces past goalies from the neutral or defensive zones. I've never seen a goalie beaten clean from that distance. Oh, and that unassisted short-handed goal? Corrin's first career goal. Dan Molenaar made sure to save the puck for the International Falls native. The Thomas line kept doing work. Sampair was making things happen with his speed. Young was using his speed and smarts to make plays, including a sweet move around Corrin when the two nearly ran into each other during an interchange along the left-wing boards. All four lines were able to hem NMU in at times, using speed to get around the rink and disrupt the Wildcats on the breakout. That "fourth line" was particularly impressive, and Scott Sandelin recognized it, making sure they got more ice time than the typical "fourth line" would in a tight game. In the third, it was all UMD. The Bulldogs took 32 more shots and got 21 of them on net. Thomas scored off a great feed by Derik Johnson from behind the NMU net to make it 2-1, and one of Tony Cameranesi's nine shots on goal found the net late in a power play to ice the game. Everyone contributed. Justin Crandall and Kasimir Kaskisuo were the only UMD players who were in the game but didn't register a shot in the official statistics. Kaskisuo is the goalie, in case you forgot. He was sharp, too, shaking off the early goal to make 16 saves, including a couple of the impressive variety when the game was still tight. Of course, only three of those saves came in the third period, as UMD outshot NMU 21-3. UMD had 32 attempts to 10 in the third, 92-39 in the game. It was a dominant effort keyed by a strong forecheck, contributions from everyone, good work on faceoffs, and solid discipline (just one penalty for two minutes). Give Doan credit, because he stood in there and took a ton of pucks. He made a few great saves among his 43, but he couldn't keep enough pucks out of the net to secure an upset win for his team. UMD got its 16th win Friday, matching its 2013-14 season total with at least 11 games (nine regular season and two guaranteed playoff games) remaining. Oh, and Friday was UMD's sixth win at home (6-4-1). We won five games at home last year (5-10-3). Despite the strong performance, a couple lineup tweaks wouldn't shock me. We might see Blake Young play Saturday, and we'll see if Willie Raskob and/or Nick McCormack get back in on the blue line. Wouldn't pass out if Matt McNeely got the start in goal, though Kaskisuo was so seldom tested Friday that it could be argued the No. 1 goalie could use some more work on Saturday. Basically, I don't know. Watch Twitter for updates when I do. Talk Saturday with the lineups. Game's at 7. Bring your money if you're going. Pink stick auction going on, as we try to raise a few bucks for the Essentia Health Foundation. I know it's probably geared a bit toward hockey players, but I have possession of a few sticks I don't ever envision allowing my son to use, since they're signed and all. They're cool sticks, and they'd make a good keepsake for fans of all shapes, sizes, and ages. Not much else going on this weekend. On Friday, Danton Heinen had a goal and two assists as Denver won 3-0 at Colorado College. DU's Tanner Jaillet got his first collegiate shutout, one week after being pulled from Saturday's relief appearance against UMD. Denver is one point back of UMD for third place in the NCHC. However, Miami can hop both teams if it beats Western Michigan Saturday afternoon. It's the only other game being played for points in the NCHC this weekend, and it's being played at Soldier Field in Chicago as part of the Hockey City Classic (Michigan and Michigan State also play at the event). No matter what, the last four weekends will be nuts. This I promise you. UMD is home this weekend and next, its only four-game homestand all season. The Bulldogs have played just twice at Amsoil Arena since a Dec. 5-6 sweep of Colorado College, having lost and tied against Western Michigan in mid-January. The Bulldogs host Northern Michigan of the WCHA this weekend in a battle that pits members of the two of the nation's three strongest leagues -- based on non-conference records -- head to head in a key series. Northern might not have NCAA at-large hopes (29th in the Pairwise), but the Wildcats still want to position themselves well for the NCAA Tournament, and they'll be determined to put in a good performance without No. 1 goalie Mathias Dahlstrom, who did not make the trip this weekend because of an injury. After a very light schedule for NCHC teams this weekend, it gets real starting next week. Four weekends will remain in the regular season, and all eight teams will be in action each week, closing things out with an intense race to the finish line in college hockey's best conference. With UMD in non-conference play this weekend, and only two other league games being contested (Denver-CC Friday and Miami-Western Michigan Saturday), I thought it would be a good chance to break down the remaining schedules for the NCHC championship contenders. The Mavericks are in the driver's seat. Third-place UMD is -- based on the current standings -- the best team UNO plays the rest of the way. That said, I do expect Western to give these guys fits next weekend. The Broncos weren't dialed in when they hosted Omaha in October. They're in much better position to make UNO's life difficult now. Everyone has been waiting for the team's youth and inexperience to catch up with it. Hasn't happened. And at this point, you'd be silly to hold your breath. The likes of Jake Randolph, Luc Snuggerud, Tyler Vesel, and Avery Peterson have shown no signs of slowing down. And neither has goalie/brick wall Ryan Massa. For UND, health is becoming a huge key, in its favor. Troy Stecher returned last weekend, former Duluth East star Trevor Olson is back, and UND finally has some depth. Dave Hakstol's teams traditionally get hot in February and March, and I expect this season to be no exception. The closing series at Miami is going to be unbelievably good. You can mark my words on that. North Dakota doesn't have the high-end skill it's had in the past, but this team works extremely hard, plays good defense, and has a top-notch goalie in Zane McIntyre. The Bulldogs need to see more of the Kasimir Kaskisuo they saw Saturday in Denver. The man they call "Kas" played his best game of 2015 Saturday as UMD won 4-2 and earned a split against the Pioneers. His save percentage the previous six starts was in the .870 range, and that isn't good enough. He doesn't have to dazzle because the team in front of him is strong and deep, but a return to 2014 form wouldn't hurt one bit. UMD had a four-game winless streak in January, but the Bulldogs played very well in Denver, and outside of the Western Michigan trip, all that remains are games against teams that the Bulldogs match up pretty well with. Miami has a game in hand on UMD and can pass the Bulldogs for third place Saturday with a win over WMU. No matter what, the RedHawks are absolutely a player in this race. The schedule is very difficult, outside of the CC series, but Miami has the horses to stay in the race despite that schedule. I will say this: Miami's only chance at the Penrose Cup is to beat Western on Saturday and take six points at CC next weekend. It'll be too hard to get a sweep in those last three series. Miami is a very dangerous team, so don't count it out. There are landmines on this remaining schedule, with North Dakota and Miami looming. However, Denver has a third of its remaining games against last-place Colorado College. Take seven or more points in those games, and the Pioneers suddenly are in pretty good shape to finish above the current pace. This team has an elite defensive corps, and Trevor Moore and Danton Heinen are two of the better young forwards in the conference. DU's goaltending was up-and-down in both series against UMD, and the Pios can ill afford to have more downs in the last four weeks. Late season non-conference series can be all over the place. They're not always easy to schedule, since league schedules are usually loaded up. While the other seven NCHC teams are playing either one or zero games this weekend, UMD is set to complete its non-conference schedule with two games against Northern Michigan of the WCHA. It's not surprising that UMD would find a way to get games in on a conference bye week late in the season. In fact, you have to go back to 2011 to find the last time UMD took a full weekend off after Christmas break. "I think guys would rather play than take a week off," head coach Scott Sandelin said this week, referencing the fact that UMD's opponent next weekend -- St. Cloud State -- is one of three NCHC teams not playing at all this weekend. So UMD forges on with its 20-games-in-ten-weekends second-half schedule. So far, so good. There was a scare in the second period Saturday when sophomore forward Alex Iafallo went down with an apparent (-ly obvious) right leg problem. Luckily, our awesome trainer got him back on the ice to score a goal later that period. He was practicing Wednesday and didn't appear to have any serious limitations. I'd imagine he plays, unless the decision has been made to rest him as a precaution. Even better is that defensemen Dan Molenaar and Nick McCormack were both practicing this week. So UMD had its (now) full compliment of 13 forwards and eight defensemen on the ice at the same time for the first time in the second half of the season. Molenaar was felled by mono out of break, while McCormack had missed time with an undisclosed injury. Don't expect much change to the forward lines. All four of them played well in Denver, helping UMD establish a strong forecheck while also doing a pretty good job defensively. I'd expect all 13 forwards to play this weekend, with Sandelin working Charlie Sampair in one night. Not sure what the plan will be with the defensemen. Molenaar made the trip to Denver and looks much healthier than when he first got back on the ice. If either "extra" is cleared, one would think they play one game. Beyond the chance to get everyone on the ice, it's going to be a key non-conference series. Northern Michigan has been streaky. The Wildcats started 7-1-1, endured some injuries and went through a rough patch (1-5-4 in their next ten games), and are now unbeaten in three. "We went through a stretch there where we struggled," coach Walt Kyle said this week. "We feel like we're coming out of that right now. I feel like we're getting close to getting our game back in order." NMU swept Alaska-Anchorage last weekend in Marquette, but it was a costly sweep. Sophomore goalie Mathias Dahlstrom went down on Friday after a collision with a UAA player. He will not be available against UMD. The Wildcats will get back to league play next weekend, very much in the thick of things for home ice advantage. Kyle says the WCHA is obviously strong at the top, but he notes that isn't all. "I think there's strength right through it. There's not much difference between a Bemidji State and a Bowling Green. There's a lot of good teams in our league. I think it's real good top to bottom." Kyle notes that the league is now comprised of a lot of Division II schools that are prideful about playing Division I hockey. I hate the term "like-minded," which was popularized during realignment a few years ago, and Kyle didn't use it here, but it does work. These schools are as like-minded as it gets when it comes to running their athletic programs. On the ice, Dahlstrom's absence creates trouble for Northern Michigan. He's been a big key to the team up to this point, with a .924 save percentage in 21 games. NMU's save percentage drops to .908 when Dahlstrom isn't manning the pipes. The Bulldogs were beaten two Fridays ago by Bemidji State at the North Star College Cup. Sandelin said he doesn't think his team had the right mindset going into that game, which ended up 4-0. "Our focus needs to be building off what we did the last two or three games," Sandelin said. "Continue to do that and get better. If we go into it with any other mindset than we need to play hard and do the things we need to do, we won't have success. "I think our guys understand. Certainly what we went through a couple weeks ago. We didn't go into it with the right mindset and you saw what happened." The first ten minutes will tell us a lot. Hopefully the Bulldogs come out with intensity and don't need to be "shocked" into the game, whether that comes from NMU scoring or just pinning the Bulldogs in their own zone for a spell, or from someone getting knocked into the middle of next week. Sandelin talked extensively about special teams at his Wednesday press conference. He said freshman goalie Kasimir Kaskisuo was his team's best penalty killer on Saturday, as UMD killed off two Denver power plays in the third period after DU had closed within 3-2. He also lauded his killers for their effort on a five-minute penalty kill in the third period of Friday's loss. The kill kept the margin at one goal and gave UMD a chance to tie late. "I thought Kas played outstanding (Saturday)," Sandelin said. "Made two or three key saves. They were huge kills at the time." The power play didn't score, but UMD got two goals in the first ten seconds after man advantages expired last weekend. "I think there's good things," Sandelin said, "but we're not putting the puck in the back of the net. We're going to try to measure power play success based on some tangible things that give you success on the power play and not if you score. The ultimate goal is to score, but we have to do a lot of things well." Sandelin said they've devised four or five categories to measure success by. He didn't get into specifics, but I'd imagine faceoffs, shot attempts, and shots on goal are on the list, along with some sort of measurement of zone entries, puck retrievals, and puck battles. Those latter things go toward puck possession, something UMD has struggled with. Over last weekend, if UMD won the faceoff to start a power play, things generally went okay until Denver got possession and cleared. Zone entries were a bugaboo all weekend. Once DU got it out, UMD struggled to get it back in cleanly. It's something to watch. I've seen improvement by UMD on the power play, but not in all areas and not all the time. I liked Saturday's power play chances, but they didn't score. If they keep doing more good things than bad, that will come around. Denver coach Jim Montgomery didn't hide from reality. Speaking to him last week, he became the latest coach to say he feels UMD is the best team his group has played against all season. Saturday, the Bulldogs showed why. Denver played well in virtually all areas, but the Pioneers couldn't neutralize UMD's speed, and the Bulldogs ended up winning 4-2 Saturday with a strong effort from all four lines, three defensive pairs, and goalie Kasimir Kaskisuo. It was a needed win to cap what was honestly a pretty good 120-minute performance for the Bulldogs. Denver is a damn good team, and UMD did a lot of things well. The Bulldogs deployed a sometimes-suffocating forecheck, forcing uncharacteristic mistakes from DU's elite defensemen. One of the things we talked about going in was the need to both be physical with the likes of Joey LaLeggia and Nolan Zajac. While UMD didn't hit either player very much, one thing it did well was take options away from them. There were turnovers forced in DU's defensive zone that allowed UMD to organize attacks and get chances to the net. The Bulldogs used their speed to make plays in all situations. They closed on outlet passes and stole possession, they made plays off the rush to score goals or set up chances, and they backchecked to break up potential chances off the rush for Denver. It wasn't perfect. Denver took advantage of a sleepy start to the second period Friday to score twice for a 3-1 lead it wouldn't relinquish. The Pioneers hemmed UMD in to set up their second goal on Saturday that cut the lead in half and made for quite the hairy second half of the third period. But credit UMD. It didn't sit on the lead. The Bulldogs didn't resort to a chip and chase game. Instead, UMD took the play to Denver for chunks of the third period, but couldn't beat starter-turned-sub Evan Cowley in net (more on that later). That alone was refreshing, because far too often we see teams try to sit on leads. In both these games, the team playing with the lead kept the pressure going in the third period. That's how UMD plays. When the Bulldogs sit back, they tend to not be as sharp, and that can lead to mistakes in the defensive zone. That's just not their style. It's why you don't see Denver look at how Western Michigan -- and, to a certain extent, Bemidji State -- beat UMD and try to duplicate that. It's not the Pioneers' style of play, and trying to do something so far outside their comfort zone could lead to trouble. Saturday's win means UMD and Denver split their four-game season series. That's a fitting result. Ignore that UMD outscored Denver for the season 13-9. The games were fun, generally well-played, and not without some intensity. Sure wouldn't mind seeing DU again. Saturday was the best game Kaskisuo has played in 2015. After posting an .870 save percentage over his previous six starts (Jan. 10 at North Dakota, Jan 16-17 vs Western Michigan, Jan. 23 against Bemidji, and the Friday DU game), the freshman from Finland got back to his 2014 form. Kaskisuo was beaten a couple times on good shots through traffic, but he stopped Danton Heinen on a breakaway shortly after UMD had taken the lead for good in the second period, then stood tall during two crucial penalty kills in the third period. UMD doesn't necessarily need Kaskisuo to steal games, and I'm not sure I'd say he did that on Saturday. But the Bulldogs need him in the form he was in on Saturday. Kaskisuo made himself big in net and wasn't about to let UMD kick away its lead. He was a key piece of the puzzle for a huge win on Saturday. Meanwhile, Denver's goaltending carousel Saturday was a bit bizarre. Cowley started the game, but was relieved by freshman Tanner Jaillet after the first period. Jaillet allowed two goals on nine shots, including one by Alex Iafallo where Jaillet had a chance to cover a soft tip on goal by Adam Krause. Instead, he let it bounce off his stick and it deflected right to Iafallo, who was driving the net. After that, Cowley was put back in the game. So the goaltender of record for Denver Saturday didn't start or finish the game. I'm not going to question Montgomery, who's done a great job in what many thought was an impossible situation -- taking over for the highly-regarded and popular George Gwozdecky after he was let go. Montgomery got this team to the NCAAs last year, and they look like they'll make it again. It's his team and he knows his players much better than I do. I'm just pointing out what happened and noting I haven't seen it before. UMD is third in the NCHC as the stretch run nears. In fact, while most of the league is either off or playing one game, the Bulldogs are the only team in the NCHC playing Friday and Saturday this weekend. The Bulldogs host Northern Michigan of the WCHA for a non-conference set. Meanwhile, Denver takes on Colorado College Friday, and Miami battles Western Michigan at Soldier Field Saturday as part of the Hockey City Classic. Northern Michigan has cooled off considerably since a 7-2-1 start to the season, but while the Wildcats are hovering around .500 at 11-9-2 right now, there's no reason to think they're a slouch. NMU owns a win at Michigan Tech, and veteran coach Walt Kyle will assuredly have his group ready to renew an old rivalry with UMD this weekend. I ran into NCHC communications poobah Mike Weisman after Saturday's game, and he said a couple of league series were scheduled this weekend but moved because of conflicts. After this weekend, everyone in the NCHC will have eight conference games left, and those eight games will be contested over the final four weekends of the regular season. Everyone will play in league every weekend, and it'll be an unbelievable race to the finish. Following Saturday's win, one of the UMD players told me "Man, sure are no nights off in this league." Couldn't be more accurate, and the race to the Penrose Cup title will be the definition of intense.